Ubisoft's limbless helicopter-head hero is appearing with a little more physical fanfare in Europe. 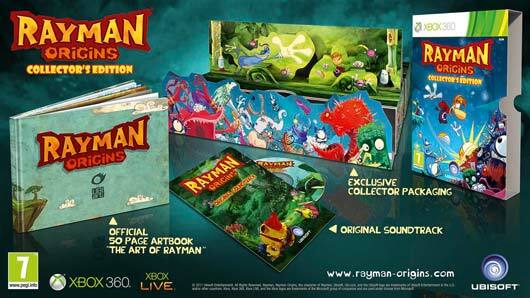 The publisher is wrapping his gorgeous return to 2D,Rayman Origins, in a Collector's Edition for Xbox 360 and PlayStation 3 this November. Even the packaging itself is special. The quality of the 50-page art book will likely match the visuals we've seen coming from the UbiArt framework (which integrates high-resolution illustrations and pairs them with a skeletal animation system), and the soundtrack will probably be described as "whimsical," but forget all that. The box itself folds into a cute diorama depicting mischief makers Rayman and Globox. Ubisoft has confirmed to Joystiq that this edition of Rayman Origins, currently listed at GBP 54.99 on Amazon UK, is only coming to Europe -- soon to be the origin of quite a few imports, we imagine.